What would Steve give his sweetheart? Creeper Candy! 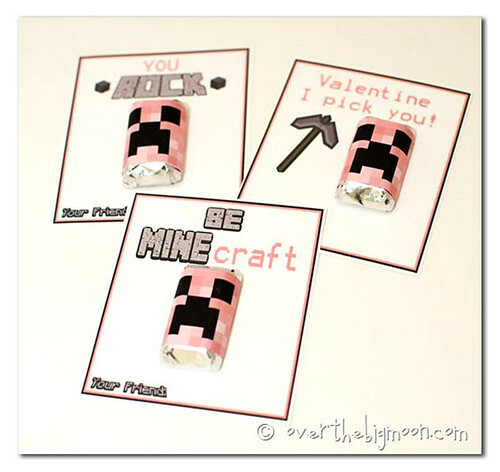 Here’s a more Minecraft Valentine ideas than you can stick a diamond pickax into! If you’ve been following my blog, you know my six-year-old is smitten with Minecraft. We got him the full PC version for Christmas…and yes, I’ve been known to play it when he’s at school. We’ve done Minecraft for Halloween, and Minecraft for Christmas…now it’s time to break some stony hearts with Minecraft for Valentine’s Day! I’ve been poking around the ‘net looking for ideas, and there’s a lot out there. I’m going to share a few of my favorites with you here. 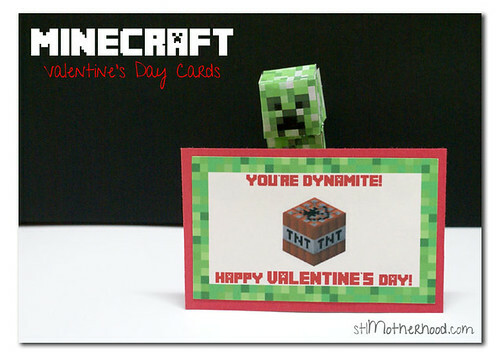 First, if you’re going to make your own Valentine Cards, you’ll want a Minecraft font. Minecrafter is a good free font to download–just remember to use a capital A to get a creeper in your lettering! 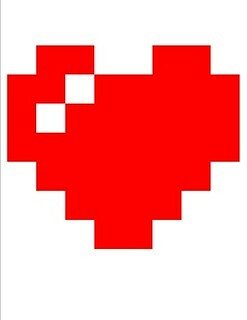 Next, you might want an 8 bit heart to deck out any cards you make yourself. Since I didn’t want to steal anyone’s art, I whipped one up myself. I made this one in Microsoft Publisher because, well, it was just easier. Sometime’s Photoshop is a pain. Grrrr. 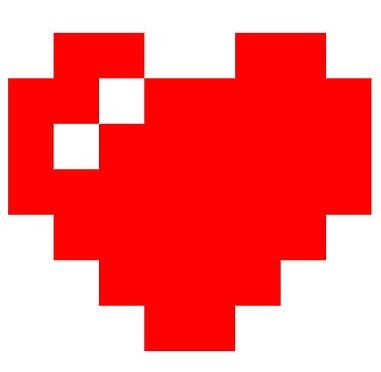 Feel free to use this heart if you want it, I’ve loaded it onto my Flickr with a “do what you will” Creative Commons. I made a few Minecraft cards of my own, see more about them here. Here’s a sample below. Cute, huh? They’re two sided cards, so you kid has plenty of room to sign them. 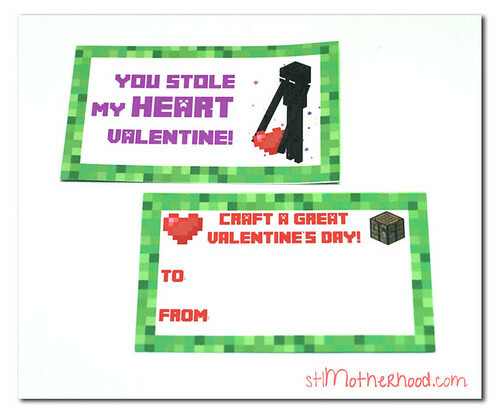 Over The Big Moon did two super cool Minecraft cards–with candy! I really like this idea. Here’s the cards in traditional green, and another set in pink. Below are samples of the pink creeper cards. 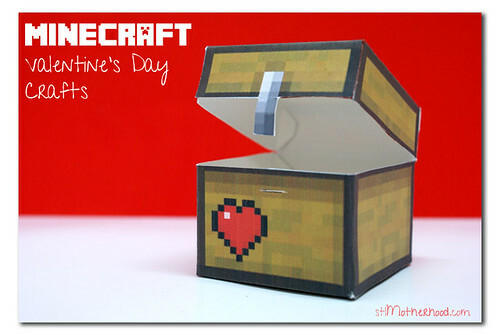 PikFiz made a Valentine Minecraft chest out of a printable that really opens! You can stash a couple goodies in this box and give it to your favorite miner. It’s a bit more work than I’d want to do for a whole classroom, but that’s just me. Maybe if we start now… I made the sample below–Mitch thinks it’s really neat. See the link above for directions. Want more Valentine ideas? Here’s how to show kids you love them with Conversation Heart cookies and crafts.